The Craftsman style home is a beautiful reaction to the industrial revolution. People began to crave handcrafted decorative arts in a time when most things were becoming heavily mass-produced. The style’s name came from a magazine published in 1901 called The Craftsman which highlighted popular architecture and furniture design. A longing for pre-industrial revolution-style homes—designed with character and built to last—drove the popularity of these homes. Craftsman style homes were the most popular style of small house from around 1905 to the 1920s. This was a time when people were turning away from the intricate, busy look of Victorian architecture. The Craftsman appearance fit the niche with its clean lines and simplicity. 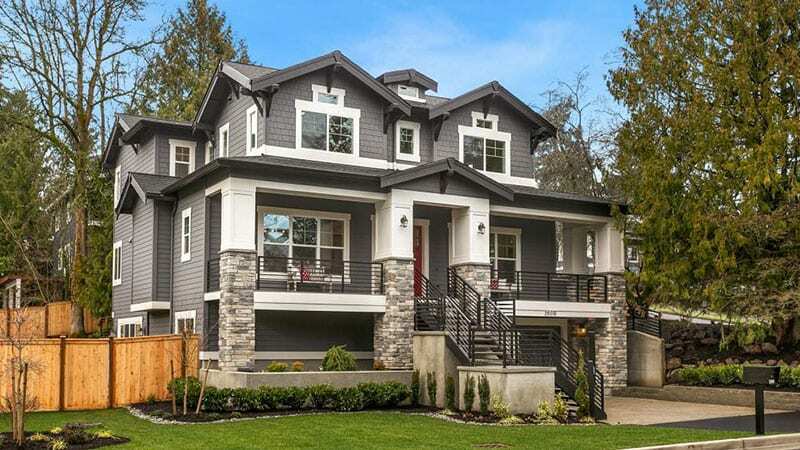 Using the aesthetics of the Arts and Crafts Movement, along with heavy influence from Asian design, the natural look of Craftsman homes quickly gained popularity among homebuyers of the day. The style was down-to-earth yet comfortable, and fit the needs of American families well. Its popularity continued through both world wars until modern architecture and design took over as the next big trend. Photo courtesy JayMarc Homes Mercer Island Wash. Recently the Craftsman home has seen a resurgence in popularity. The quality and artistry of the Craftsman home has proved timeless and has influenced the design of homes ever since. People are still drawn to the beautiful overall look of the design from the natural materials to the finishing details. Beyond the beautiful look of the homes, families today like the Craftsman’s simple, open layout. These floor plans offer the flexibility to connect while giving family members the space to enjoy their daily routines. The open floor plan of the Craftsman home is a precursor to the popular open layouts of today’s homes. People like open interiors because they improve traffic flow, provide more options for furniture layout, and encourage family interaction. Many new homes follow popular Craftsman design with dining areas in the kitchen, and open living rooms centered around a large fireplace. The grand fireplaces common in Craftsman homes make a great focal point and are very popular in areas with harsh winters and cold nights. The large front porches that define Craftsman homes encourage added interaction with neighbors, a bonus that many homebuyers look for when finding the right place to settle down. Another advantage to Craftsman houses includes the extra storage space from the built-in bookcases and cabinetry. These features improve the usability of the living spaces, and the custom woodwork gives the home a warm, welcoming appeal. These open-concept layouts are also easy to renovate if the homeowner wants to make changes down the road. Craftsman style homes are inherently eco-friendly since they tend to have a smaller footprint and less interior space than some newer homes; they use less material to build and less energy to maintain. The use of natural building materials like stone and wood also add to their sustainable design, which is a strong selling point for many homeowners. All these advantages make a Craftsman home warm, stylish, and comfortable to live in.